thats a really beautiful one you’re wearing in the picture on top andrea! Thank you! The truth is that I find most of my scarves at vintage/thrift shops. They are simply AMAZING for scarves (at least, the ones near where I live are.) I think this one cost me a grand total of $4 which is unbelievable… it’s 100% silk! It seems that it was made by sewing of strips of fabric together. I just got a few days ago! thank you for sharing; you do amazing job and your tips are very useful! blue colours become you very well. does Judith have a website? I have no account on facebook:) but I would like to check her website out. She does have a website – judithdeparis.com… but as far as I can see it’s still under construction (not all of her stuff is on there). Thanks so much. You are doing a great thing for Jewish women out there. I just started covering my hair this year, and sometimes it’s such a sticky thing to do. I’ve got three kids, and I feel frustrated with my scarves sometimes when I have no time to take to figure out how to tie it. Thanks. Hi Kim, thank you so much for writing! One of the best ways to make tying easier, is to just pick one way of doing it, and stick with it until you can do it in your sleep. Then you can move on to another way. Otherwise you’ll get overwhelmed by ideas and frustrated that it takes so long. Let me know how it goes! did you lso buy the volumizer online? if so, from where? thanks! Your videos are insanely helpful. Thank you SOOO much! i actually live in israel. do you know where i could find them here? and what they would be called in hebrew? thank you so much! If you walk into mea shearim (aka walking east on Malkei Israel where in turns into Mea Shearim)… there is a store on your left that sells all varieties of skirts/tops and also has a large section of mitpachot. They have the inexpensive volumizers for 3/100shekels, or 35 shekels each. There is also a mitpachot shop to the west of the tachana machazit in Jerusalem that has Rinati Lakel volumizers for a very good price. Let me know if you want more details! oh my gosh. THANK YOU. i have been wondering for the longest time why i have been having such trouble tying the mitpachot properly. it wasn’t that i wasn’t properly, it was that most of them look better (in my opinion) with the volumizer and i had no idea how to get that volume. i don’t know when i will be going into Ylm next, but hopefully before chag. I have a few mitpachot i was hoping to wear. Your site is amazing and beautiful! Thank you so much for all the info on it. Do the volumizers come in different colors and sizes? also, sorry, i have so many questions. do you know where i could get accessories, and what they would look like on the back? THANK YOU! I can give you specific places to shop in ylm, but really, most hair accessory shops have lots of pins and clips. Try placing them in different locations… at the back beside your bun, underneath your ear, above your ear, etc. You’ll be surprised how different locations completely change the look! I think I’ll try the sock. I feel terrible, once I saw a woman in the store who was wearing a bandana and stopped to ask me how I got the bun with my scarf. I off-handedly said, “oh, you just have to have a ponytail back there,” and her husband nudged her to keep walking and I realized she’d had cancer and didn’t have hair. I still feel guilty and wish I’d told her how she could stuff something in her scarf to create the illusion of hair or anything. I am sure that she knew that your intention was not to hurt her, and that you were just sharing what you knew! We can’t help the things that we don’t know. Hopefully she finds out about stuffing it some other way, and you can continue being a kiddush Hashem and wrapping your hair beautifully! By the way – I was taught to cut the top off of a pair of control-top stockings and it is not only way cheaper but works wonders for keeping tichels from slipping. Just another idea. so, i had one of the no-slip headbands already, but i just bought the volumizer. Made a WORLD of difference when wearing tichels. It gave the look i have been trying to achieve for a while now. Thank you! I’m so glad to hear that you are loving it! Yay! I just love my comfort grip band. I am wearing my scarfs more now that I have it. Next thing I would like to try it the volumizer but wasn’t sure if it would look to big on me in the back. I do pretty good with tucking in the tails of one scarf to get the bun look but sometimes I don’t want to wear two scarfs. The sock and extra scarf tucked in didn’t give me the look I wanted. Love the new videos. I get lots of compliments on my scarfs that I have learned to tie by watching your videos. I even wear them to work a few days a week now. You are a blessing. Shalom. I had it rough to find that comfort grip band here in Scandinavia. Finally – today actually! – I found an Etsy seller who lives in Europe and the shipping charges were reasonable. I hope this will end my worries about scarf slipping off. I have to anchor my scarfs on my forehead and I have round face and well…not good. Thank you so much for your informative blog posts! Tips and videos have helped me a lot during these years I have been covering. You truly have been my inspiration. That is wonderful news that you found the grip comfort band… yay! I am very glad that you found this site and are enjoying it. Is there nowhere that imports from Israel? I would be glad to help you find a way to get a volumizer! Hi! I love your site! I personally have a very broad hairline – like, low on the neck and low on the forehead and all around the ears. I would like to be able to wear a tichel and still cover ALL of my hair. So far the only way I can cover ALL of my hair is actually with a sheitel. Any suggestions? How do us hairy folks do it? Hmmm I honestly don’t know! I would recommend finding a scarf that has a similar texture and colour to your hair, and wearing that underneath, covering all of your hair… and then doing a wrap on top. Does that sound like it would work? Let us know! The problem is that a head (my head) has a certain curve, and the scarf doesn’t “tie” around the whole part where there is hair! Maybe I could send you a picture? I’ve been thinking about this myself and am playing with some ideas. One idea consists of two mitpachot, one tied lower on the forehead to get the front hairline, and a second one in a different color more vertically, farther back on the head so that it can get the hair toward your nape. For hair in front of your ears, what about a style that includes either a drape or thick fringe that goes in front of your ears? One of those scarves with fringe at the edges done in a simple wrap with the tails brought up over your head could be arranged so there is a lot of fringe in front of and behind your ears I’m also thinking a modified princess style wrap that is pinned over the ear rather than behind it might help, or a regal wrap with tails brought forward over your shoulders instead of tucked into the back. I’ll have to play with this idea some more. Loulou, I have the same problem: low forehead and low on my neck. Have you figured out a good solution since you posted this? And, I suffer from headaches so I cannot have the tichel tied at the back of my neck, and I hate to use more than one on my head at a time. So, all day long, I am tying and retying trying to keep all my hair underneath. I have tried with a volumizer and without. Right now, the only thing that I can think of growing my hair long enough to make a real bun. And my hair, unlike Andrea’s is very thick. When I get it cut, I have usually had it layered to cut down on the bulk. But, now, I am thinking that my natural thick hair may work well. I have just begun covering my hair in the last few months so I have really been struggling. So, I would love to know what you figured out that works well for you. Or, Andrea, have you figured out something. Thanks for any suggestions. I should add, I would like to at least try not to look like a Muslima while doing it, because where I live (Europe) there are so many Muslims that if I wear something that looks too similar, it feels like I am wearing a nun’s habit – like I am dressing up as someone from another religion! Use lots of colour and if you don’t cover the neck, most people won’t assume that you are Muslim. I can sympathise with the woman who wrote that she’s frustrated, trying to find time to learn this, with three children and a home to care for. I teach full time, am a college student full time, and can’t even seem to find time to shop for a scarf or two to practice with (Here in central Wisconsin, there doesn’t seem to be much available in thrift stores. Stocking caps, yes; scarves…..nah.). I’m going to have to wait until I graduate, I think, to find time to fully investigate these scarves. I’ll go on with the one I’ve worn for years and keep reading this blog for fun (sneaking out of studying to do so). I’m so thankful to at least read of other women who have this practice–it’s an encouragement. Thank you for the time you put into maintaining this website. I’m not sure where to put this note, but I just tried something and I think it is working. I found an inexpensive pashmina with lovely sheen and the perfect color (at a thrift store), made of acrylic, but it was too bulky for me. I altered it to a triangle shape and it wraps much better. It’s reversable, so I’m able to fold a couple of inches back on the front to make it look as if there are two scarves; it’s quick to wrap it into a simple knot. Let me know if you’d like me to explain how I altered it….it can be tricky to cut and sew on a bias line with a loosely woven fabric. The trick is to sew first, then cut. I know that many Muslimas use special pins to hold their hijabs in place (I saw a demonstration once). Do women in our communities find those pins helpful? Some of the pins come with beautiful decorations that look fabulous and can really dress up the look. (I personally have no problem with sharing looks with Muslimas and other women who cover, and as was pointed out above, most of them cover the neck, so it wouldn’t look the same anyway. 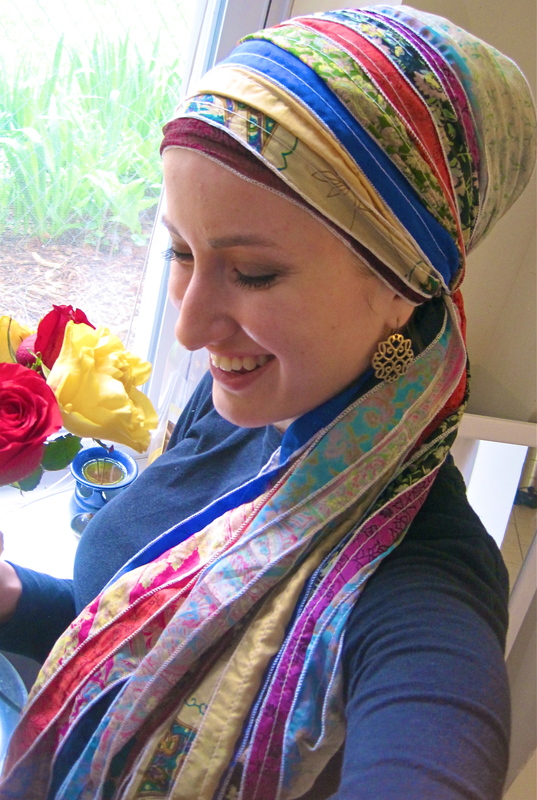 Although I’m now divorced and don’t cover anymore, some of the websites that carry scarves and hair accessories for Muslim women offer wonderful options.) Love this site and the fashions you and the other “wrap stars” wear! Very inspiring — and I’m of an older generation. Hi Basya, I have a velvet headband as well and after a while of use, they do stretch out. I have hand washed mine and they don’t seem to shrink at all. What you can do is sew it to make it small again but don’t over do it 🙂 and do it where the seam will not bother you. Good luck! Hello. and i want to know where do you get the white shape for the wrapunzel at? wrapunzel.com! 🙂 Look under Essential Tools to find our shapers! Amazing!! Can’t wait to get started! Waiting to hear from you regarding the purchase of the Lg Volumizer through Judith de Paris! Saw many on other websites, but like the one you show in your video. In the meantime, I’ll just keep watching all your wonderful tutorials!